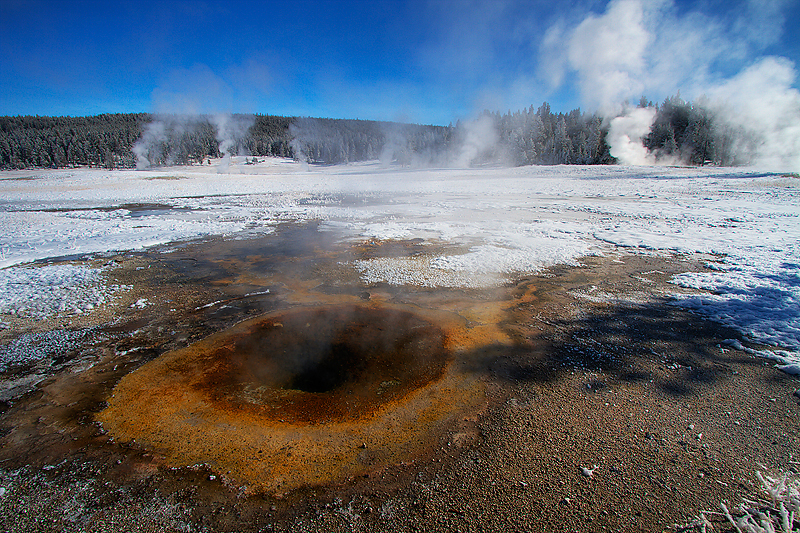 Geysers can be found all over the Yellowstone NP, these are features that are known around the world. Many come from great distances to see 'Old Faithful,' this geyser is quite impressive, but one of the least visually interesting in relationship to the beautiful landscape of Yellowstone NP. The smaller, mostly unnamed, geysers of the park are not something to overlook. Theses features provide an opportunity to come within a reasonable distance of the geysers (just make sure to be very careful and extremely respectful of the landscape, these geysers are very dangerous). The smaller size also makes it possible to incorporate the geysers opening into the landscape. Several geysers can be found in a single area, the smoke plumes in the background can add a level of drama and interest to the composition. I hope everyone enjoys the photograph! I appreciate any type of feedback, positive or negative! Technical details: - Canon 7D, Canon 10-22mm lens (@10mm), circular polarizer filter, ISO 100, F/8, three shot HDR, each two full stops apart.